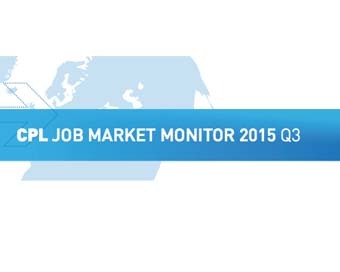 The Cpl Employment Market Monitor (Q3, 2015) shows that there has been a steady increase in the number of jobs posted since 2011, the base year. Although a little slower than in other quarters, the jobs numbers continue to grow into Autumn 2015. A shortage of some skills, particularly in the tech sector, means that nearly all employers today are choosing attitude over experience. 96% of nearly 500 employers who responded to the Cpl Employment Market Monitor (Q3) believe that staff with a great attitude can be taught the skills they need. The survey also demonstrated a perception gap between employers and jobseekers – employers are having difficulty finding all the skills they would like in candidates (thus the willingness to take candidates with good attitudes who can learn on the job). Jobseekers feel the employers hold all the cards. This perception gap has been in existence since the survey began in 2013. Nearly all employers (95%) need students with practical experience during their education. Theoretical know-how no longer cuts it: they want students who have practical experience of their chosen field before landing their first job. 50% of employers are now banning social media in the workplace. Previous Cpl Employment Market Monitors showed employers estimating productivity lost to social media at approximately 10 hours per week per employee. However, it is yet to be seen how easy such a ban will be to police since staff can use their own devices in work. The survey also found that 60% of employers will turn a blind eye to CV embellishment or lies, so long as the candidate performs well. A further 60% of employers throw curved balls in interviews – asking impossible questions to assess the candidate’s reaction to the challenge. “This Quarter’s Cpl Employment Market Monitor shows that with continued jobs growth in the FDI sectors in Ireland, companies are finding it more challenging to locate all the skills sets they would like in candidates. Our survey results highlight the difficulties of screening a candidate on CV alone. As a result employers are opting for will over skill,” commented Peter Cosgrove, Director, Cpl Resources. “The days of classroom based learning are nearly gone. Companies want graduates who have practical knowledge of their chosen field. Universities are increasingly including placements and internships in their courses as a result,” he added. Read the report (pdf) in full here and visit our WMB Careers section in partnership with Cpl for career advice.